Barcelona, 9th May 2018 - The CNAG-CRG is one of the top European genome analysis centers. Its mission is to carry out projects in DNA sequence analysis for the improvement of quality of life in collaboration with the European and International Research Community. To keep up with this objective, the CNAG-CRG has recently acquired a second Illumina HiSeq 4000 and an Illumina NovaSeq 6000. These sequencers are complementing the instrument park by high throughput and cost-effectiveness across a wide range of applications. With the addition of these instruments to the existing array of Illumina and Oxford Nanopore Technologies systems, CNAG-CRG now offers even more versatile methodology to sequence large and heterogeneous sequencing projects. The Illumina NovaSeq 6000 is the most powerful and scalable Illumina sequencing instrument using proven Sequencing-By-Synthesis (SBS) technology. In function of the selected flowcell sequencing through put can match HiSeq2500 or HiSeq4000, or can exceed either instrument with the latest S4 flowcell with a sequencing capacity of 3 Terabases. Novaseq is suitable for large sequencing projects with the ability to sequence an entire human genome at 30x coverage in an hour or one RNA Seq library (30 million reads) every 10 minutes. This makes it the fastest and the highest throughput NGS sequencer to date. The new NovaSeq Xp workflow gives NovaSeq even more flexibility for loading flow cells, together with the simplicity of cartridge-based reagents and onboard cluster generation. 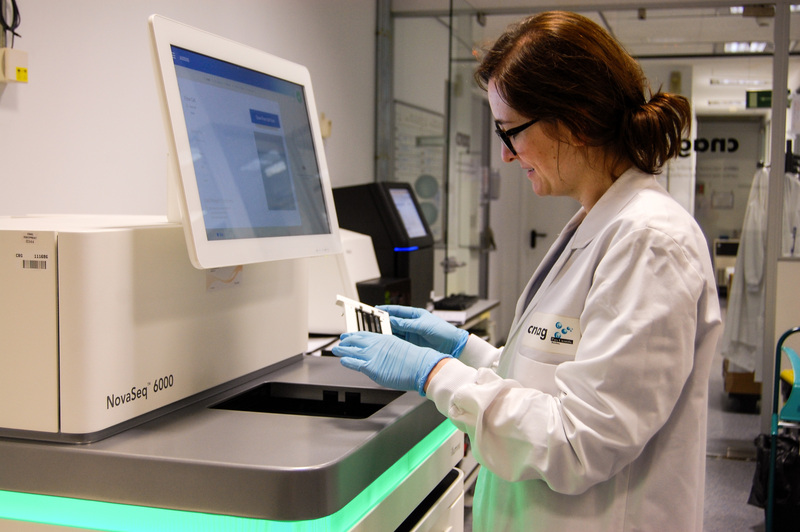 With the new acquisition and upgrades the CNAG-CRG has more than doubled its sequencing capacity to 7 Tb/day enabling scientific and clinical projects of any size or sequencing application. The cost of this operation is co-financed at 50% with funds from the European Regional Development Fund (ERDF) corresponding to the 2014-2020 “Programa Operativo Plurirregional de España (POPE)”. The funds are allocated to the Secretary of State of Research, Development and Innovation (SEIDI), within the Spanish Ministry of Economy, Industry and Competitiveness, and intended to finance projects and actions related to infrastructures included in the Map of Unique Scientific and Technical Infrastructures (ICTS) in force. CNAG-CRG is included in the Spanish Map of ICTS since 2014. The CNAG-CRG has been involved in many international initiatives such as the International Cancer Genome Consortium (ICGC), the International Human Epigenome Consortium (IHEC) and the International Rare Disease Research Consortium (IRDiRC) as well as in large basic and applied research projects with tens of thousands samples being sequenced and analyzed. The CNAG-CRG also has a dedicated Single Cell Genomics Team, which is involved in the Human Cell Atlas (HCA). In 2017, the CNAG-CRG sequenced almost 7.000 samples, and generated more than 130 Terabases of sequence data. CNAG-CRG also operates its own High Performance Computer with 3,500 cores and 7.5 Petabytes of data storage. The entire operation at CNAG-CRG is tracked using an in house developed Laboratory Information Management System. CNAG-CRG is certified as Illumina Certified Service Provider, Agilent Exome Sequencing Certified Service Provider and is member of Roche Sequencing Solutions® Technical Certification Program for its expertise in running the Roche SeqCap® EZ target enrichment system. The processes at the CNAG-CRG are in compliance with ISO 9001:2015 certification and ISO 17025:2005 accreditation.